Even allowing for that, you might want a bucket handy. There are nice ways to do pasta salad, but this isn’t one of them. Mix the chopped macaroni and vegetables; moisten with French dressing, ﬂavouring with garlic if liked. Serve on a dish lined with lettuce leaves. Decorate with mayonnaise and minced pimento or chives. Another Creative Commons photo taken when I was out on the bike. 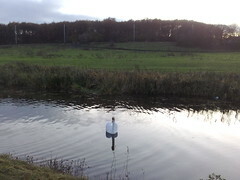 I stopped when I saw some swans swimming on the canal and got the camera out. One swam past but there was another one behind it. When it saw me it started posing for the camera (probably expecting some food) so I got a couple more of it. Also, quick recipe for gingerbread coffee syrup. In lieu of getting to Starbucks to have one of their gingerbread lattes or buying some from a shop I thought I’d try making some. Very easy to do but a little goes a very long way (2 teaspoons is more than enough for a standard cup of coffee). Peel the veg and cut into cubes. Remove seeds from the butternut squash.